Do you start your day with a cup of tea? 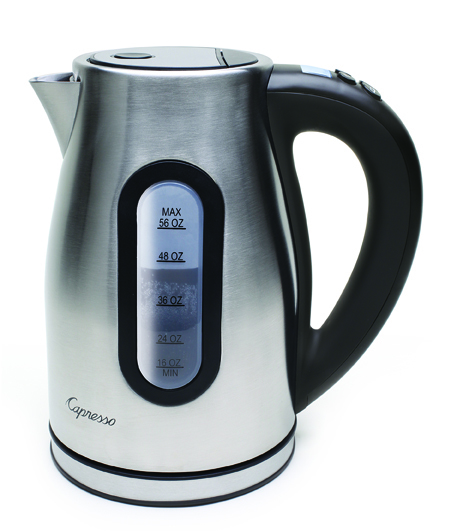 Spoil yourself with the convenience of an electric water kettle from Capresso. These electric water kettles offer more speed, energy efficiency and safety than stovetop kettles. They are perfect for tea lovers and also come in handy for preparing French-pressed coffee, heating water for yeast bread recipes and boiling water for instant oatmeal. 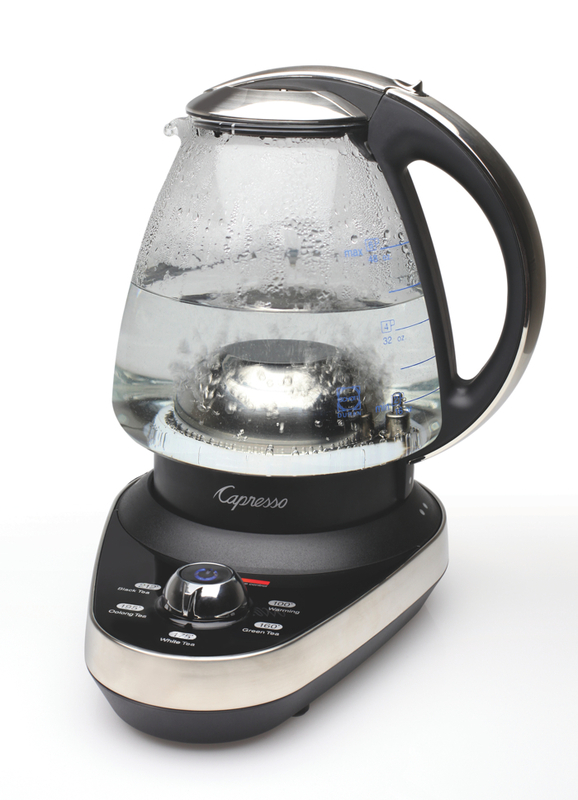 Capresso offers a full line of stylish electric water kettles. They all boil water in about half the time as stovetop kettles, saving time and energy. They offer numerous safety features such as boil dry protection which shuts the unit off when no water is detected, automatic safety shut-off when water has reached the desired temperature, and shut-off when kettle is removed from base. They also have heat resistant, cool-touch bottoms, which allow for placement directly on a table or countertop for easy portability and serving. Crafted from durable German made SCHOTT glass, the Capresso teaC100 features 5 temperature settings that heat water to the perfect temperature for extracting maximum flavor from Black, Oolong, White or Green teas. Each setting is clearly labeled on the base of the unit, taking the guesswork out of selecting temperatures. 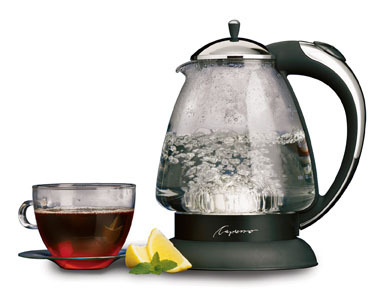 The largest model in the Capresso line, this sleek 56-ounce electric water kettle is perfect for tea lovers who like to entertain. Easy to use, its 11 digital temperature settings from 110°F to 212°F offer precise control, and its easy to use. A programmable Warm feature keeps water warm for up to 40 minutes. This beautiful glass water kettle is a focal point in the kitchen. Made of elegant German-made SCHOTT glass, the Capresso H20 Plus quickly and quietly boils up to 48 ounces of water with just the push of a button.